PORCUPINE LAKE opens on Bea (Salisbury) as she rests in the back of her parent’s station wagon, peacefully unaware of the quiet tension that fills the front half of the vehicle. The juxtaposition of a picturesque countryside and her parent’s uncomfortable silence evokes a strange feeling of melancholy while staring through the lens of something utterly beautiful. The family is traveling across a Norman Rockwell like landscape to take over a restaurant bequeathed from Bea’s grandfather. The “Snack Shack”, situated in Port Severn Ontario, represents a missed opportunity for this struggling young family to start over. Scotty sees this as a chance to fix up the place and make a go of it, while Ally is only interested in selling. Ally and Scotty, absorbed with their own problems and mounting tensions from the restaurant leave Bea mostly to her own devices. One morning, while Bea is enjoying some of the Shacks breakfast offerings she sees Kate (Hall). A young girl with curly hair and a unique sense of style. Bea, immediately drawn to Kate, follows her from a distance when she leaves the restaurant. The two girls come from different backgrounds and have wildly different personalities but after a few brief encounters, they become fast friends. The innocence of first love and navigating the waters of how to handle newly found independence; Bea is in the midst of a transformation. 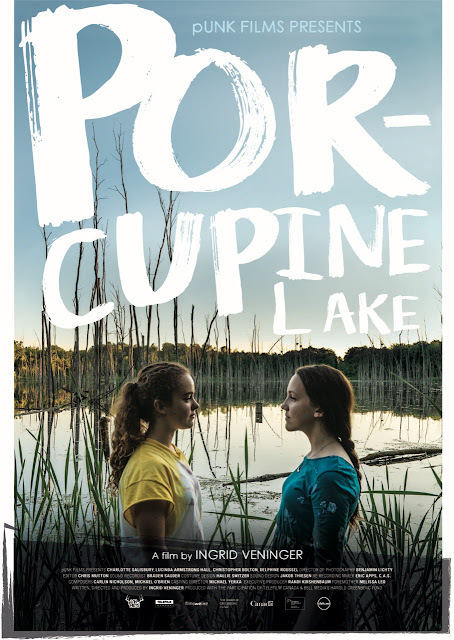 Films about first loves are commonplace, but few capture the awkward innocence of adolescence as well as PORCUPINE LAKE. The first kiss between Kate and Bea, one of the more honest moments in any film this year, perfectly encapsulates the capricious nature of change. How we seldom take time to acknowledge the big moments, allowing them to pass by without missing a beat. Veninger delivers PORCUPINE LAKE with the breezy carefree pacing of a small town summer, taking the time to dwell on smaller moments. She explores the humanity or her characters by showing them move through their lives. Building each character so methodically allows her the freedom to avoid telegraphing every emotional arc. It’s easy to project yourself into this film. I cannot imagine a person who will not see some version of themselves on screen. Veninger builds her film on a foundation of trust where ambiguity is a tool for bringing in the audience as opposed to distancing them. PORCUPINE LAKE will be having its world premiere at TIFF 2017. For more information and showtimes click here.